IE isrecognized as one of the world’s top business schools by international journals such as The Financial Times and The Economist. IE emphasizes culture of innovation and entrepreneurship as an integral part of its drive towards academic excellence. The campus is centrally located in Madrid, the epicenter of Spanish culture, business, and politics. The international student community, and dynamic learning environment are at IE’s core. IE is a pioneer in business education, educates tomorrow’s business leaders following the values of entrepreneurial spirit, diversity, innovation and social responsibility. The unique blended methodology at IE, which combines online education with face-to-face periods, allows students to manage flexibility of working and studying at the same time. IE Business School presents changes, innovations and creativity. It is a school that revolves around its students in order to meet their needs and conditions in constantly changing world. Because you change we change with you! 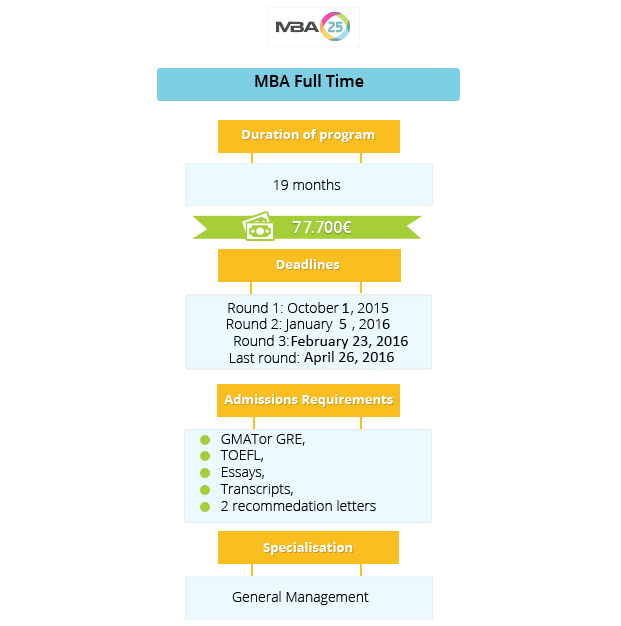 Admission requirements: Application form online, GMAT/GRE, TOEFL/IELTS, ESSAYS, CV, OFFICIAL TRANSCRIPTS, 2 RECOMMENDATION LETTERS.